FRONT HITCH: The B50 front hitch enables front implements like blades, brooms and snow blowers to be easily attached and removed making your tractor even more versatile. COMPACT TRACTOR, BIG COMFORT: At Kubota, comfort is a top priority. Features: 1. Wide and Flat Operator’s Station – Easy to get on and off with plenty of leg room to increase operator comfort. 2. Modern Dash Panel – Easy-to-read with all the information displayed right in front of the operator. 3. Easy-to-Use Controls – Simple controls that are easy to understand and operate, even for first time users. 4. Kubota Treadle Pedal Design – Effortlessly change speed and direction using Kubota’s forward and reverse treadle pedals. 5. Deluxe High Back Seat with Armrest– Increases operator comfort. 6. Tilt Steering Wheel – Allows you to adjust the steering wheel for maximum comfort. 7. Rubber Floor Mat – Reduces noise and vibration, creating a more comfortable ride while decreasing fatigue. 8. ROPS Version - Available with ROPS. 9. 3-Range Hydrostat (HST) Transmission – With an easy-to-use HST paired up with a Kubota 3-range transmission, you’re sure to find the right balance of speed and torque to get your job done quickly and efficiently. 10. Cruise Control – Allows the operator to maintain a constant speed without keeping their foot on the HST pedal. 11. Hydraulic Independent PTO – Easy-to-use, no clutching or stopping. 12. Ready for a Long Day – Standard cup holder, tool box and large fuel tank capacity. DESIGNED TO PERFORM, BUILT TO LAST: The B50 Series is designed with strength and longevity in mind. Features: 1. Kubota Diesel Engine – Kubota is the #1 manufacturer of under 100 HP non-automotive, multi-cylinder diesel engines in the World. 2. 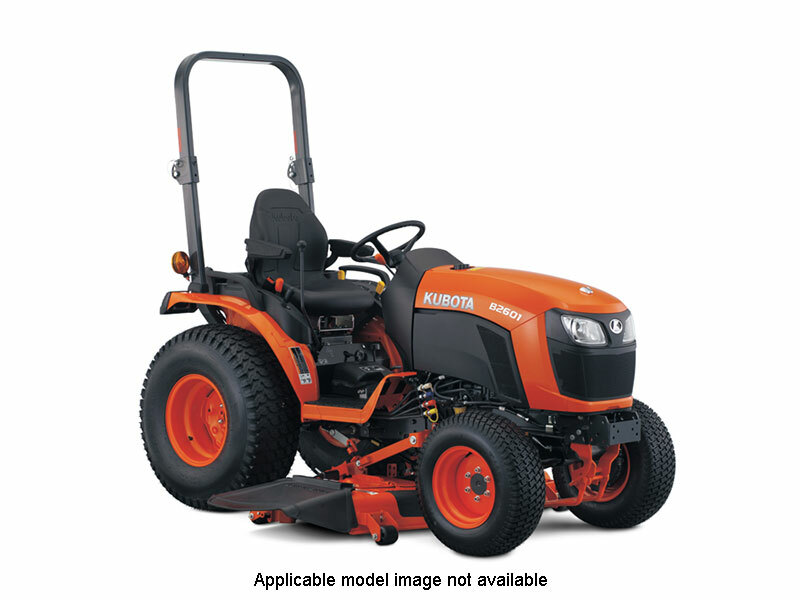 Kubota Performance Matched – The B50 Series is built by Kubota for Kubota, it’s not a rebranded product built and distributed by multiple manufacturers. 3. Metal Hood and Fenders – Strong and durable metal hood and fenders will not only protect your equipment, but keep it looking good for a long time to come. 4. Kubota HST with 3-Range Transmission – Smooth and dependable HST Transmission with an easy-to-use range selection to optimize power output to meet your needs. EASY-TO-USE: With its easy-to-use HST, great control placement or the simple-to-use PTO system, the features on the B50 Series tractor will make any operator feel like an expert. KUBOTA VERSATILITY: With a huge selection of Kubota Performance Matched implements and attachments, Kubota has what you need to get your work done. No matter if it is a front end loader, backhoe, front snow blower, mid-mount mower deck or a 3-point implement, Kubota has the right tool for the job. COMFORT IS KEY: Comfort is always a top priority with Kubota. The B50 Series has plenty of features to keep you comfortable – no matter how long the job takes. The B50 Series features: 1. ROPS. 2. Deluxe Suspension Seat. 3. Wide, Flat Operator Station. 4. Ergonomic Controls. 5. Tilt Steering.